I saw this recipe a while ago and decided I must try it–it had five stars and tons of reviews, and I’m a sucker for those huge chewy bakery style chocolate cookies. Although the cookies are good and the title lives up to its name–they are in fact big, fat, and chewy–this recipe won’t be replacing my favorite chocolate chip cookie recipe. These cookies are huge. I used a three tablespoon scoop (a little less than 1/4 cup) and ended up with only 15 cookies. I also had an issues with the chips separating from the batter so while the first batch was in the oven, I stuck the batter in the fridge and that seemed to solve the problem. I know this recipe!!! It’s my absolute favorite chocolate chip cookie recipe – and I’ve tried plenty of them! yum. This is very close to the Cook’s Illustrated recipe (I think theirs has an extra 1/8 C of flour and maybe an extra 1/2 tsp baking soda). It’s my favorite chocolate chip cookie recipe! They have all sorts of weird instructions about how to form the balls of cookie dough, and turning the tray around halfway through baking, but I just ignore them and bake like usual. They do very well if baked on parchment paper! these look really good! I like using brown sugar. I found you through flickr when I was looking for a chocolate chip cookie my husband would love…..these are it! 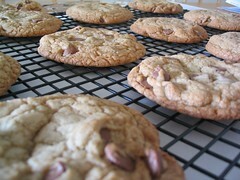 I’ve used this recipe for both chocolatechip and white chocolate, they are sooooooooooo good!!! thank you thank you..and sooo glad I’ve found you! I have been using this recipe for sometime now . Its the best!! It makes the big old fashion type cookies and everyone loves them ! I always make it with 1/2 semi sweet chips and 1/2 white choc chips . These are gone in seconds !